From 17 March until 14 May 2017, Cc Foundation, with the support of Lisson Gallery, presents British conceptual artist Ryan Gander’s first solo exhibition in China. The exhibition will include new work created specifically for Cc Foundation, presented alongside recent installations by Ryan Gander, some of which are from the personal collection of Cc Foundation’s founder, David Chau. Contradiction lies at the heart of the exhibition. The dichotomy between human and nonhuman, utility and futility, success and failure are all made apparent in mirrors with no reflection, inanimate figures that express emotion and a site-specific installation made of ball bearings. At once reminiscent of an amusement park, Willy Wonka’s chocolate factory and an industrial production line, the installation features a stainless steel sprout from which metallic bearings are ejected, projected one by one in random order and in different trajectories across the room. Landing on thick carpet, the shiny floor of reflection lights both the space and viewer, providing a reflective surface in which only parts of oneself can be seen. The work begs the existential question: where does it all come from? Open-ended questions of this nature fascinate Gander, who says the work is an exercise in total futility. It reminds him of man's first landing on the moon, but not the glory of Neil Armstrong’s momentus 'step,' but rather the astronaut left on the space-shuttle in orbit, waiting to pick him up, circling round and round in space wasting time. Perhaps the most pointless effort of all is the daily collection of ball bearings to refill the hidden reservoir, feeding the pointlessness to begin once again the next day. 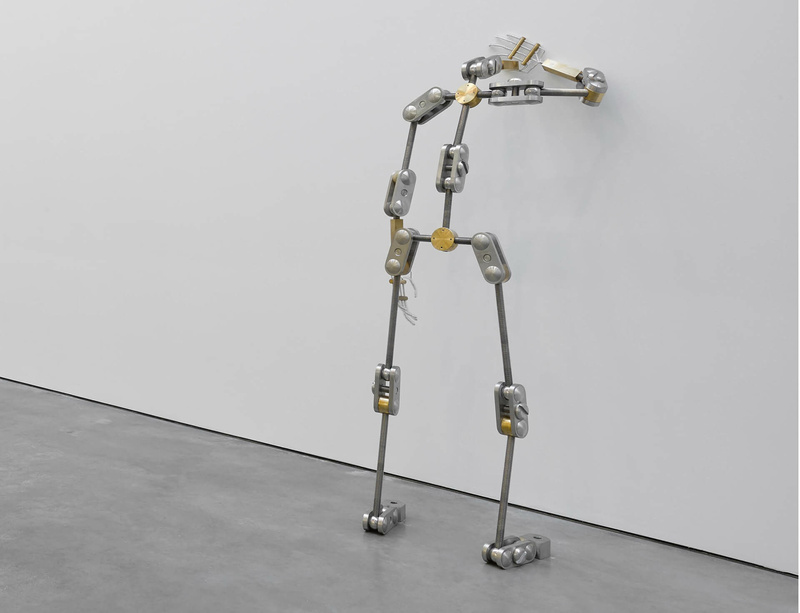 The mechanics and materiality of this installation relate to new sculpture featured in the show, including the latest figure in Gander’s series of life-size armatures that were first shown at Lisson Gallery New York in September 2016. Titled Dramaturgical Framework, in reference to Erving Goffman’s sociological approach that uses theatre to portray and evaluate social interaction, these sculptures, with rectangular brass faces deliberately left blank, are arranged in dramatic positions to illustrate the possibility of gesture as a form of emotion. Similar to the installation, the work consists of both a human and non-human element through its ability as an inanimate object to express feelings of sadness. Self-reflexive in nature, the figures are based on animators’ models of themselves, the smaller versions of which often appear broken and damaged alongside its full-sized self. In Shanghai, the figure is shown instead looking at a glowing rectangular box on the wall – what Gander imagines an artwork might look like in a cartoon. The work plays on the notion of spectatorship, shifting the relationship between spectator and spectacle: as one enters the space, one encounters an artwork, looking at another artwork. By looking at the armature, we are able to consider our own position as a viewer and acknowledge the effects of our presence. The glowing pastiche deliberately matches the size of another artwork on view, calling into question our conceptualisation and constitution of art. Equally playful, a marble dust-sheet is draped over a stately, gold mirror, further suspending our disbelief as we are dragged from fiction back into reality and back again. With reflections obscured from view, the barriers inherent to self-reflexivity are starkly revealed. The work is also a direct reference to the speed of technology, the obsession with self, evermore apparent in the growing selfie culture of contemporary society, and how self-generation negates the idea of self-image.